A very unique artifact of the ancient Tao tradition of China. Created during the Han dynasty in the 5th century BC. Known by various names: 'Bronze Dancing Water Basin', 'Chinese Spouting Bowl', 'Chinese Fish Basin', 'Jumping Water Basin' or 'Chinese Singing Fountain Bowl'. These ingenious bowls create 'standing waves' which produces water to spout up to 3 ft. high. Made from a bronze alloy from a foundry on the outskirts of Beijing, and when the handles are rubbed by the palms of the hand, the bowl begins to hum and vibrate, and the water in it spouts up due to the creation of 'standing waves'. Used in the early Tao Temples for the purpose of meditation and as a science tool for the study of 'standing waves'. 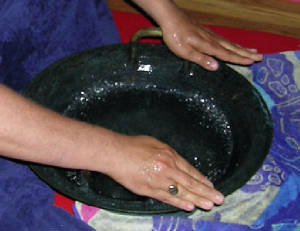 The bowls are cast in the lost wax process. * These basins are currently being marketed as "Tibetan Adulation Bowls". There is no credible evidence that the Tibetans used these in their monasteries. The Chinese have imported them into the markets of Lhasa along with the story that they were used by the Tibetans. All it is, is a story, thats it. I showed a spouting bowl to a group of Tibetan Lamas and Monks about 2 years ago. They had never seen such a creation, but were nonetheless, very amused by it. We want to thank Frank Jang of San Mateo,California for providing information regarding this instrument.